Wait no longer to start bringing fresh and healthy food to your table. 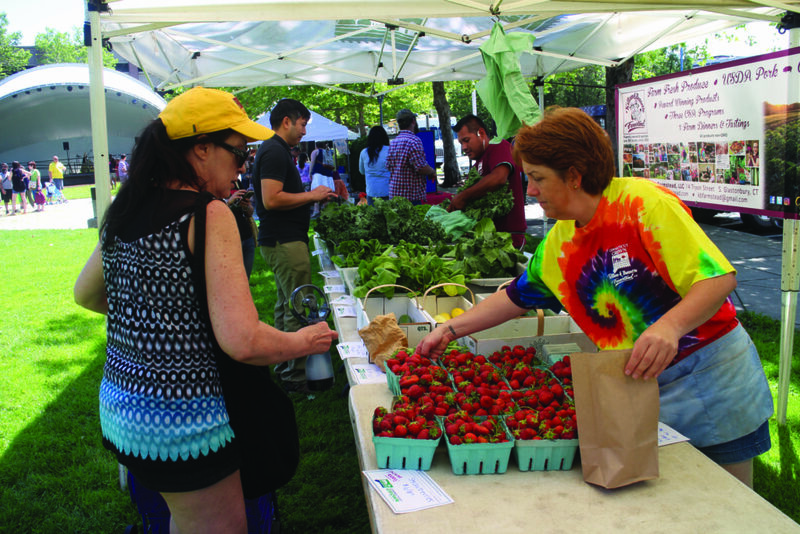 On June 24, the CityCenter Danbury hosted the first Farmers’ Market at the Danbury Green on National Place from 10 am to 2 pm. With fresh grown produce, shoreline clams, homemade maple syrup and artisan bread, the market is a one-stop shop for all your healthy food needs. Held by the Danbury Farmers’ Market Community Collaborative (DFMCC), the event featured live music; nutrition, health, and fitness activities; free downtown trolley rides, and, of course, fresh food from vendors all over Connecticut. Credit and debit cards are accepted. WIC/Senior FMNP and SNAP matching dollars and vets certificates available. There is complimentary parking at the Patriot Garage, located right across from the CityCenter Green at Independence Way. The Farmers’ Market at the Danbury Green will be held every Saturday through October 21. If you are interested in learning more about Danbury Farmer’s Market, Connecticut fruits and vegetables in season, how to become a vendor and much more, visit www.DanburyFarmersMarket.org, contact Peggy Zamore by calling (203) 792-1711 or email at info@danburyfarmersmarket.org.